Our happy recipients of 2 x LabelOn™ labeling machines could not wait to unpack their machines. They unpacked the machines, fitted the Swivel controls and even did some tests ahead of an installation engineer and ahead of even receiving a manual. This highlighted the intuitive design and clear layout of both electronics and mechanics. As with any machine install there were some items on the machine that had moved during transport but the clear layout of electronics and the self-evident design of the machine meant any teething problems were quickly and easily dealt with. Within hours of the machine unpack the machines had been tested and was running production. Only after having taking a little time to review the manual did all the features of the machine available further impress the clients. The Two LabelOn™ labelers were installed recently into Juicy Isle Tasmania each with the capacity to label Front and Back labels and add a small neck or spot label. Immediately the client began to appreciate the features and precision of adjustments and not available to them with the three labellers they had previously been using. This “Fruit Juice” LabelOn™ labeling machines placed provided benefits that became self-evident within days of installation. Every Physical Module adjustment and even Guide Rail adjustments have a rule or scale for recording. Label Heads fitted with a large roll diameter of 380mm (Compared to most “common” labellers with only 320mm roll diameter capacity or less) – If you were considering a typcial 90mm Dairy label this would increase the number of labels from about 5500 per roll to 8300 per roll reducing your label roll changes/stoppages due to finished rolls of labels by a third! Label Heads fitted with Clear Label Gap Sensors; providing the flexibility to use clear and opaque labels: INCLUDED! End of label Roll Sensor and Alarm INCLUDED! Missing label (on Roll) Alarm INCLUDED! Plugs for all electronics and internal wiring clearly labelled, laid out and easily accessible; making service and repair fast and easy. Labeling Machines are machines that automatically apply pressure sensitive labels to various products. A pressure sensitive label consists of a label substrate and adhesive. First developed in the late 1970s, today there are hundreds of manufacturers of label applicators worldwide. The LabelOn™ Labeler is a self-adhesive machine that brings together experiences from around the world. The designers for LaberlOn™ have placed self-adhesive equipment into facilities around the globe. We are proud of the LabelOn™ Modular machine quality of build, finish, design and versatility. With our genuine understanding of , we possess the ability to work with the daunting level of variables that must be considered in the label application process. Our understanding and experience have helped us achieved our label applicator’s degree of capabilities and ease of use; for their owners the LabelOn™ Modular label applicators represent a machine that is a pleasure to operate. Using apples for apples comparison, the LabelOn™ modular machinery is priced to knock out any serious competitors. Aside from the quality and the machines capability, it contains combination of features that are unlikely to be matched by equipment nearly twice its price. The simplicity of setting up the LabelOn™ Modular machine is a design objective. With the LabelOn™ Modular machine the label applicator can be set up to cater for one or two labels onto almost any conventional shape of bottle; round, flat, tapered or oval sided. There is no point to have this flexibility unless it is quick and easy to change from one bottle shape job to the next and very different bottle shape job. The LabelOn™ Modular machine achieves fast and easy product changes with an insightful and efficient machine design. Where other machines can take hours to change from one size to another and even longer from one shape to another, the LabelOn™ Modular can safely boast that it takes minutes to change from one job to a totally different shape and size application. The LabelOn™ Modular labeller is designed with the foresight to easily adjust and record the position of all needed and not needed modules quickly for any scheduled Job. The ease of maintaining a LabelOn™ Modular machine is another design target. None of the electronics is “hard wired” into position. All of the electronics are clearly labelled, modular and can be removed with the minimal of tools. The layout of electronics and how they can be accessed is made with regular or even large sized hands in mind (not tiny hands on the end of impossibly thin arms). The service support of the LabelOn™ Modular label applicator is something that can be achieved from around the world or next door, thanks to the records kept on each machine and the use of web based technology implemented to provide support. Prior to manufacture, any updates are added to three dimensional records which can be recalled in no time by our team. The LabelOn™ Label Applicator is a self-adhesive machine that brings together experiences from around the world. The designers for LaberlOn™ have placed self-adhesive equipment into facilities around the globe. Experience is the name we give to our mistakes and the designers for LabelOn™ embrace mistakes and problems as opportunities to add to their experience and build on the existing strengths of their equipment. Labeling accuracy from a machine can be simply broken down to its core components being the accuracy of label feeding, the accuracy of product control, the accuracy of product sensing and the accuracy of label control. The LabelOn™ label applicator uses five phase stepping motors to give the best combination of smooth label feed and high resolution label position control for the label feeds. More basic two Phase stepping motors used on older design equipment get hot, they are noisy and they have far fewer stop positions as they turn to dispense a label. The variation in label placement from the LabelOn™ label applicator comes primarily from the variation in the products to be labelled. The LabelOn™ applicator recognises that product variation is a part of and the LabelOn™ label machine design is built to deal with this product variation efficiently. When dealing with flat bottles or oval bottles the LabelOn™ label applicator employs an Overhead Hold Down conveyor that goes beyond the design of most other equipment. The LabelOn™ Overhead Hold Down Conveyor is Synchronized to the labeller Main Conveyor as is the Label Feeding 5 phase stepping Motors of the LabelOn™ label applicator. The LabelOn™ Overhead Conveyor is servo motor driven for accurate speed control with smooth, quite and cool operation; compare this with other equipment using cheaper motors or stepping motors for a noisy and hot operation that invariably ends in squeaky dry bearings that drive the machine operators crazy. 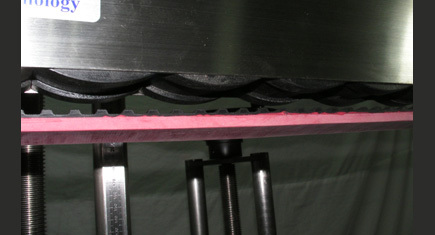 The LabelOn Hold Down conveyor has multiple independent spring loaded plates behind the hold down belt allowing for greater bottle or product height variation of the products passing through the labeller; without this facility lesser labellers have no way to deal with two slightly taller bottles reducing or removing the hold down pressure on a slightly smaller middle bottle passing through the labeller. Without the Hold Down Conveyor performing its critical product control function the of the uncontrolled bottle or product to be labelled results invariably in unacceptable label accuracy. Pressure sensitive is dependent on smooth label application; allowing for label pressure to be applied where the sticky label and the product to be labelled meet at a controlled and appropriately synchronized speed. It is simple thinking or ignorant thinking from our competitors to believe one label speed synchronising ratio suits all bottle label situations. 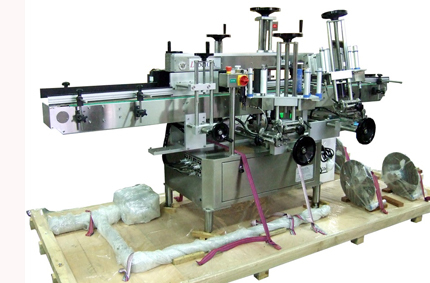 The LabelOn™ Modular equipment allows for appropriate speed synchronized speeds to be set as it allows for situations where the label and bottle synchronising needs to be adjusted as can be the case with oval sided bottle applications, high angled surfaces or conditions where bubbles of air are being trapped under the label and a wiper solution needs this speed fine control. In most cases the LabelOn™ Modular label feed synchronising is set to the optimum default ratio, however, the LabelOn™ Modular label applicator has the control available for the user when and where it is needed. The ease of setting up the LabelOn™ machine is not an afterthought; it is a design target. With the LabelOn™ Modular machine the label applicator can be configured to cater for one or two labels onto a round bottle or onto a flat bottle or onto a tapered bottle or onto an oval sided bottle. There is no point to have this versatility unless it is quick and easy change versatility. The LabelOn™ machine achieves fast and easy product changes this with an insightful and efficient machine design. Other machines can take hours to change from one size to another where the LabelOn™ Modular can safely boast that it takes minutes to change from one job to a totally different shape and size label application. The ease of servicing a LabelOn™ Modular machine is also a design target. None of the electronics is “hard wired” in place, all of the electronics are clearly labelled, modular and can be removed with the minimal or tools using normal or even large sized hands (not tiny hands on the end of impossibly thin arms). The support of the LabelOn™ Modular label applicator is something that can be achieved from around the world or next door thanks to the records kept on each machine. Prior to manufacturer any updates are added to three dimensional records which can be recalled in moments by our team. Our records enable problems initially relayed over the phone to be quickly narrowed down to an area of the machine where the assembly components of that area can be individually or collectively manipulated on a screen to pinpoint parts or adjustments that are needed to get the most out of your machine and its accuracy. Where our competitors have become complacent with their machine updates; failing to use available technology and expecting monopoly like high premiums for machinery and service, the LabelOn Modular machine has stepped in to provide an unmatched combination of operation and service in its design and true value for your capital equipment labeller budget.